Yesterday afternoon I decided to buckle down and make the angel eyes work. I redid all the wiring, making it cleaner. The internet told me that there would be a red wire with a white stripe in the fuse box under the passenger side cabin air filter under the hood, and sure enough there was. The internet also told me that this wire would have power as soon as the key was inserted and the power would stay on for a few seconds after the doors were locked. This part was not quite true. I used my multi-meter to determine that the wire was powered when the ignition was turned on and the power stayed on for about 5 seconds after the car was turned off. Close enough for me! I used an IDC tap (as much as I hate those things) to add a fuse to the red/white wire and ran the appropriate wires to the lights. Bingo-bango. 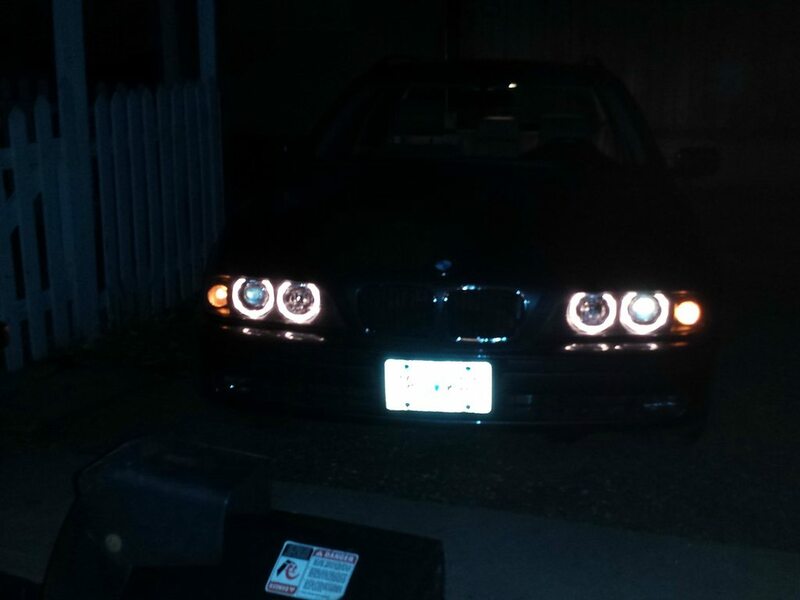 The angel eyes come on when you start the car and turn off a few seconds after you turn off the ignition. Here is a crappy cell phone photo showing the eyes.